Hi.We have a large clump of this in the wilder part of the garden that seems impossible to dig out.Can anyone identify it please? If the one in the middle with the spiky top has red roots, then it is what we know as pig weed here in Hungary. We can usually pull them out of our sandy soil but they are prolific and keep coming up. It has taken us 2-3 years to get to the point where parts of our garden are now clear from them. There's other things in that pic as well. Maybe others will have some ideas. No red roots but a yellow flower as i remember from last year.I think thats ground elder under it too.It was growing in a huge clump last year and try as I might despite digging it wouldn't all come up.This bit has popped up again as I knew it would. 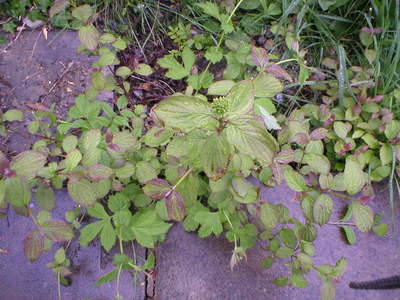 The leaf in centre looks very much like a type of mint and would fit with your root problem as invasive if not contained.The plant to the left looks like common buttercup - hence the yellow flowers. Thanks Bonkers.I've googled and yes it does fit with mint as you say. I'll have a sniff tommorow before i attempt to deport it again.Many Thanks.